For nearly 60 years, BOËT StopSon has been designing, manufacturing and installing soundproof cabins / rooms for hospitals, clinics, universities, schools, laboratories and medical centres around the world. 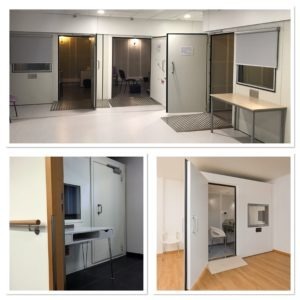 If you need a single standard screening booth, a booth for custom audiological examinations or acoustic treatment of an existing room, you can be sure that the equipment manufactured by Boët StopSon will fully comply with the acoustic criteria, technical standards and national and international specifications. Simple construction and / or double walls.